Viola, age eight, is sold to the Night Guild by her alcoholic father. In the city of Praamis, the Night Guild controls all the crime. They are brutal and organized. And they need new recruits to keep the coins flowing. Viola is thrust into a training regimen under the command of Master Crimson. She’s abused, deprived of food and sleep, broken down, all to ready her to be an apprentice of the Night Guild. But before she can even start her apprenticeship, she has to survive her initiation. She’s the smallest child present, the only girl, and she will have to work hard or face the fate of those who fail. Scared and brainwashed, her name taken away and replaced by a number—Seven—she will have to use all her wits and strengths go survive. Especially when the big, bully One wants to see her fail. Can she survive life in the Night Guild, or will she discover what happens to those that fail? Nothing is given in the Night Guild. Everything has to be earned. Child of the Night Guild puts the grim in Grimdark. This story rides wild highs and dark lows. As Viola/Seven is broken down and rebuilt into a thief, into an assassin, into a member of the Night Guild. 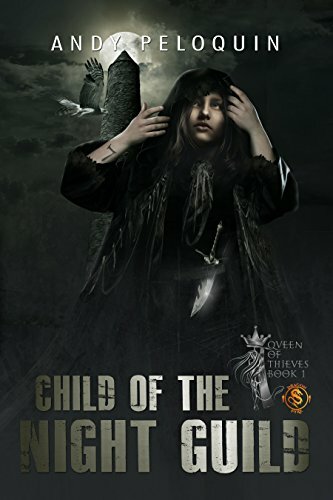 Set in the same fantasy world as Peloquin’s Last of the Bucallarii series, Child of the Night Guild delves into such a personal, intimate story of a vulnerable girl hardened into a weapon. This story is not for the faint at heart. But if you love great writing, engaging fantasy, compelling characters, and harsh struggle, then you will find yourself rooting for this small girl, celebrating at her successes, grieving at her loses, and fearing at her failures. Does she have what it takes to survive. And does she even want to? Will the Night Guild destroy her? Will the frail girl who liked to sew with her mother be forever lost? Peloquin’s writing only gets better. If you haven’t read his works, check them out. I was given an ARC, but I liked it so much I bought the story. You can buy Child of the Night Guild form Amazon!